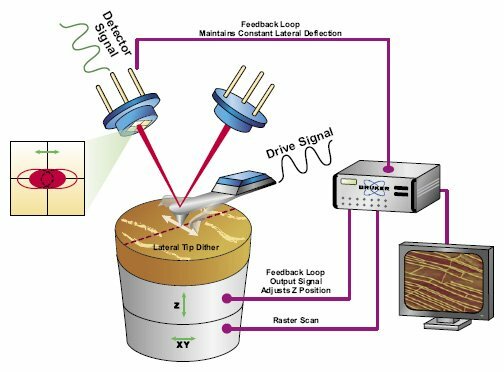 BOSTON, Massachusetts – November 27, 2018 – At the 2018 MRS Fall Meeting & Exhibit, Bruker today announced the release of the AFM-nDMA™ mode for Dimension® atomic force microscopes (AFMs). 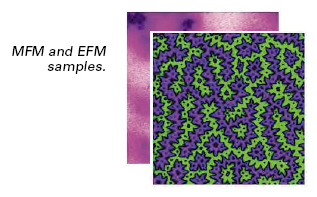 Going beyond the quantitative elastic modulus mapping enabled by Bruker’s exclusive PeakForce QNM® mode, AFM-nDMA provides first and only nanoscale viscoelastic measurements that match bulk dynamic mechanical analysis (DMA) over the entire frequency range typical in bulk rheological measurements. 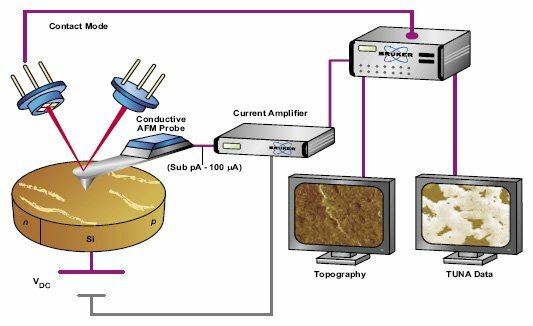 Enabled by proprietary algorithms, AFM-nDMA works directly at rheological frequencies, quantifies preload and adhesion, and comes with absolute calibration. 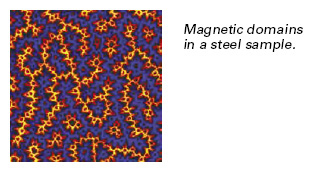 As a result, AFM-nDMA generates entire master curves of storage modulus, loss modulus, and loss tangent, including analysis for activation energy, thus vastly expanding the AFM market by providing polymer rheology at the nanoscale. PeakForce Tapping™ is an AC imaging technique, i.e., the cantilever is oscillated but well below resonance. This results in a continuous series of force-distance curves. In addition to direct force control by keeping the peak force constant, a multitude of material properties can be extracted and quantiﬁed from the force-distance curve at each pixel within an image, such as modulus, adhesion force, and deformation depth. 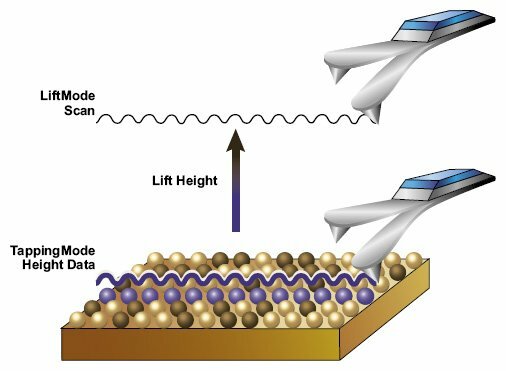 LiftMode™is not an imaging mode, as it by itself does not measure a new quantity to reveal new information, but rather a technique that enables other modes such as MFM, EFM, and SCM. 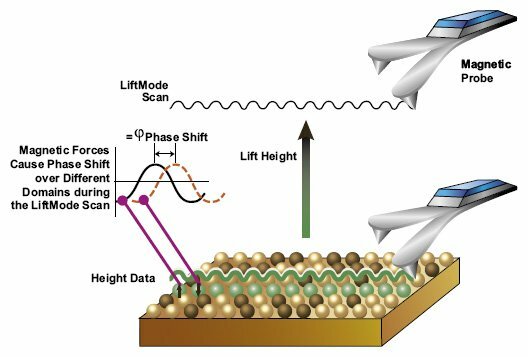 In LiftMode the sample is scanned ﬁrst in a regular topographic mode: Contact, TappingMode™ or PeakForce Tapping™.The following line, the “lift line” traces the previously acquired topography back and adds a Z-offset. 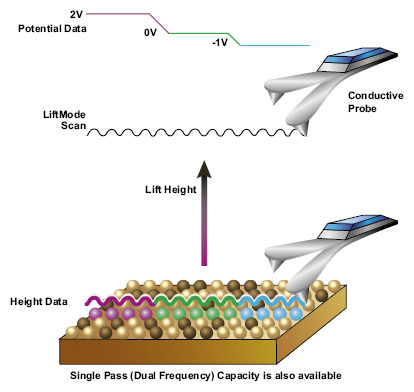 As the feedback laser is not necessarily needed during the lift line, experiments that would be inﬂuenced by laser light can be enabled (DarkLift). 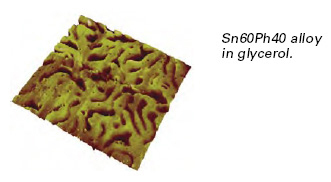 Surface Potential Microscopy (SPoM) is based on the macroscopic Kelvin method. 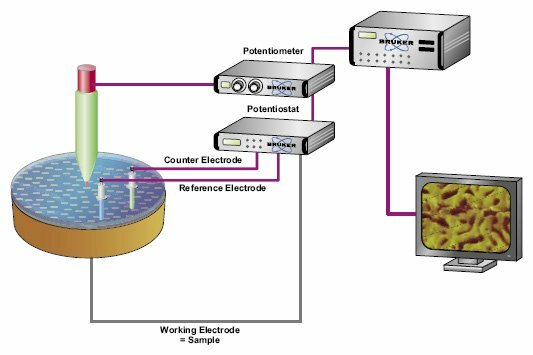 SPoM is able to measure surface topography and surface potential (VDC) information simultaneously. 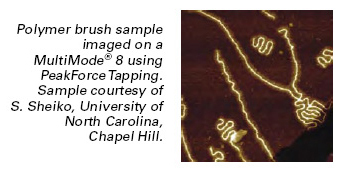 Topography is acquired using TappingMode™ operation but with a conductive tip. The electrical information is extracted by applying AC and DC voltages to the tip. The total voltage acting on the tip is: V = VDC + VAC sin (Ω t). A dedicated feedback loop adjusts the DC voltage to the tip to zero the contact potential difference between the tip and surface at each pixel, making DC a measure of the surface potential. SPoM can be carried out using LiftMode™ or in a dual-frequency one-pass fashion. 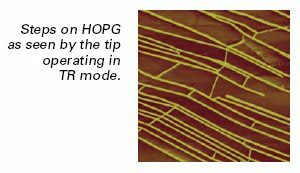 STM is a primary AFM mode. The probe is a metal needle. 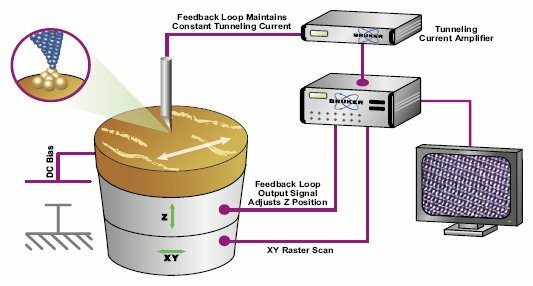 Detector signal is the tunneling current between the tip and sample when an electrical bias, V, is applied. In feedback mode, output signal usually adjusts the Z position of the scanner to maintain a tunneling current setpoint. 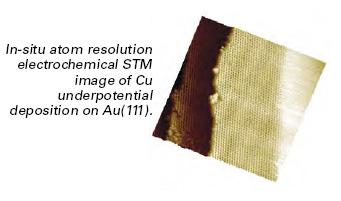 STM is the highest resolution AFM. During Torsional Resonance (TR) Mode, the tip is actuated parallel rather then vertical with respect to the surface. 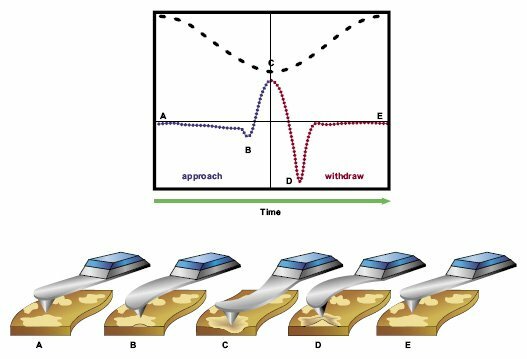 Forces between tip and sample cause a change in resonance behavior that can be used to track the surface at a constant distance. TR has the advantage that the tip remains at a constant distance to the surface at all times. This can be advantageous in modes like TR-TUNA or nearﬁeld-optical experiments. 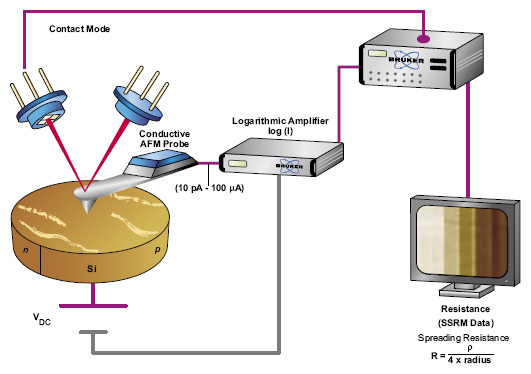 TUNA and Conductive AFM use contact mode AFM and a conductive probe. Sensor signal is the electric current between tip and sample for an applied DC bias. In feedback mode, the output signal is the DC bias, adjusted to maintain the electric current setpoint. Current range is from fA (TUNA) to µA (CAFM). Applications include studies of dielectric strength and thickness uniformity in thin ﬁlms, e.g., for semiconductor and data storage devices, and conductive polymers.